Ameet J. Pinto received his PhD (2009) in Civil Engineering from Virginia Tech with Prof. Nancy Love. He did his post-doctoral research with Prof. Lutgarde Raskin and Prof. Chuanwu Xi at the University of Michigan before working as a Lecturer at the University of Glasgow (2012-2015). He has recently started as an Assistant Professor in the Department of Civil and Environmental Engineering at Northeastern University. His research focusses on microbial ecosystems at the interface of infrastructure and environmental/public health, with a particular focus on drinking water microbial ecology. You can find out more about his research interests at www.pintolab.com. 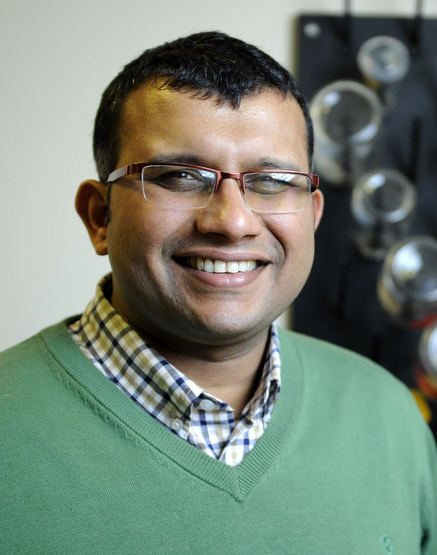 Read Ameet’s Emerging Investigators article ‘Microbial communities in full-scale drinking water distribution systems’ here. My first research article was on development of process strategies to mitigate the impact of toxic contaminant spills on wastewater treatment plants and this one is on microbial communities in drinking water systems. Over the years, I have moved from process engineering to microbial ecology while also transitioning from one end of engineered water cycle (wastewater) to the other (drinking water). It has been a fun learning experience; one that has helped me appreciate the critical relationship between microbiology, technology, and environmental/public health. I have been thinking a lot lately about how we could predict and (possibly) control microorganisms that end up in our water supply system. It’s really not very novel – wastewater engineers and treatment plant operators have been doing it for a long time. It’s just that a majority focus in the drinking water field has been on eliminating biology rather than exploiting it – and that’s the space where I think there is lots of room for innovative thinking and exciting research. – What do you see as the biggest challenge or threat to drinking water distribution systems? In the immediate future – water conservation. Enforcing water conservation practises at the consumer’s end without addressing the legacy infrastructure that transports water to them seems short sighted. It will have significant implications for water quality and safety. – How did you find out about the Environmental Science journals and how was your experience publishing with us? I don’t remember how I heard about the Environmental Science journals, but I have been reading papers in Environmental Science: Process and Impacts for a few years now and was really happy to see the launch of Environmental Science: Water Research and Technology in 2015. My experience with the submission and review process was excellent and look forward to submitting here again in the future. – We can see you are active on Twitter (@watermicrobe). What are your views on social media and academia? I will be at ASM Microbe 2016 in June. I am co-convening a session on the Urban Water Cycle Microbiome with Lut Raskin at that conference. I will also be at the International Society of Microbial Ecology Conference in August and the Microbial Ecology in Water Engineering conference in September. It is shaping up to be an exciting summer! Talk about your ideas often and openly. If it is a good one, someone might offer to help you out with it or if they are already working on it, they’ll invite you to collaborate. If it is a bad one, someone might talk you out of it. Ameet graduated in 2003 with his baccalaureate in Chemical Engineering from the Institute of Chemical Technology, University of Mumbai. He got his Master of Sciences in Environmental Engineering from the University of Alaska Fairbanks in 2005 and graduated with this PhD from Virginia Tech in 2009. His doctoral work was in the range of wastewater building with specific spotlight on miracle occasion discovery and moderation and the impact of annoyance on the microbial biology of initiated slop frameworks. Frequently, the articles from applications in other disciplines share techniques or approaches that can adapted to groundwater problems. Since impact factor is a consideration, EMS journal has a 4.5 this year. The journal may be a good fit for a groundwater modeler.